Parsley is not just a garnish that accompanies meals on restaurant dishes: this dark-green, leafy herb of nutrients. The two common varieties of parsley are Italian parsley, which has a more fragrant and pleasant taste, and curly parsley, which has a bitter taste, and is more often used as a garnish. Parsley is believed to have been cultivated over 2,000 years ago in the Mediterranean region of Southern Europe. Parsley is a good source of vitamin C and folic acid, one of the most important B vitamins. Folic acid is important in helping the body to convert homocysteine into benign molecules (homocysteine in high levels can damage blood vessels). Folic acid is also important for helping to prevent certain cancers. Look for parsley that is fresh and deep green in colour. Choose crisp bunches, and avoid ones that have wilted or yellow leaves. This is an indication that the parsley is either too ripe or damaged. 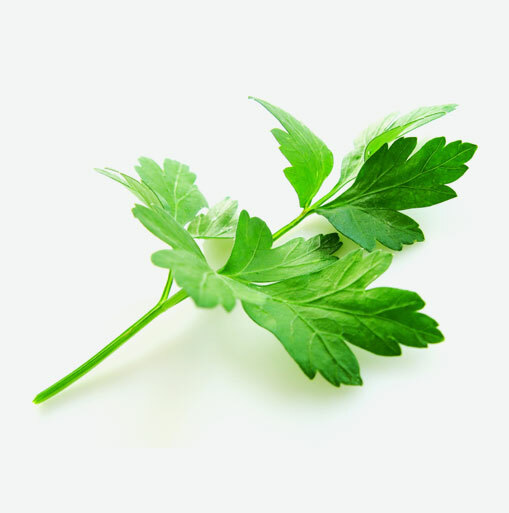 Keep fresh parsley wrapped in a paper towel in a bag and place it in your refrigerator. Wash the parsley in a bowl of cool water and allow the soil to settle. Rinse once or twice to get all the sand and soil out. Wash the parsley just before using. Add parsley to your soup pot when making chicken stock. You can also use parsley in pesto sauce to make it greener. Use chopped parsley, minced onion and grated lemon zest as a rub for chicken, pork or lamb. Add parsley sprigs to your green salads. Sprinkle fresh parsley over various dishes such as veggies and fish.